Ice-fishing season is officially over. 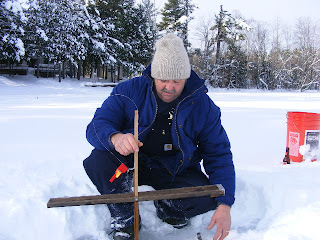 We had four wonderful months of ice-fishing season here in Maine. 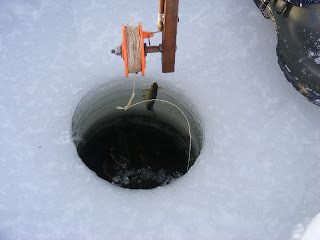 With a total of 120 inches of snow accumulated this winter season... ice-fishing was a blast. My hubby introduced me to a lot of his hobbies. But I love ice-fishing more. Despite the freezing cold, despite the waiting game, despite the hassle of dragging all our equipments to the frozen lake... I enjoy it a lot. I have lots of wonderful moments with my hubby during this season too. We ice-fish almost every weekends. Hubby was the most patient guy I have ever met. That is in terms of ice-fishing only. We would spend the whole day in the frozen lake playing the waiting game and still we never caught anything. 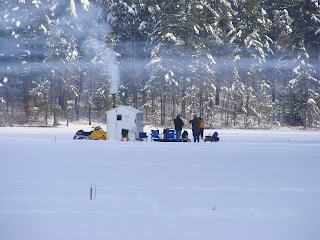 One of the shacks in the frozen lake where the anglers hang out while waiting for the fish to bite. Hubby calls this baby "The Ogre". 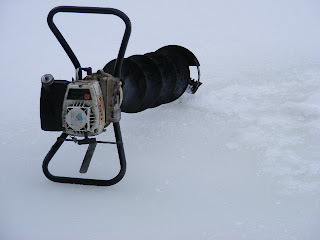 This is what he used to drill a hole in the ice sheet where he will put the fish trap. This is how the hole will look like after drilling and how the fish trap will be set. Hubby is setting up the fish trap. We usually ride the snowmobile going to the frozen lake. We sometimes set up a tent too and camp for the day. My very first catch. Hubby calls it... the junk fish. I'm still proud of it, though. I'm Ruthi . 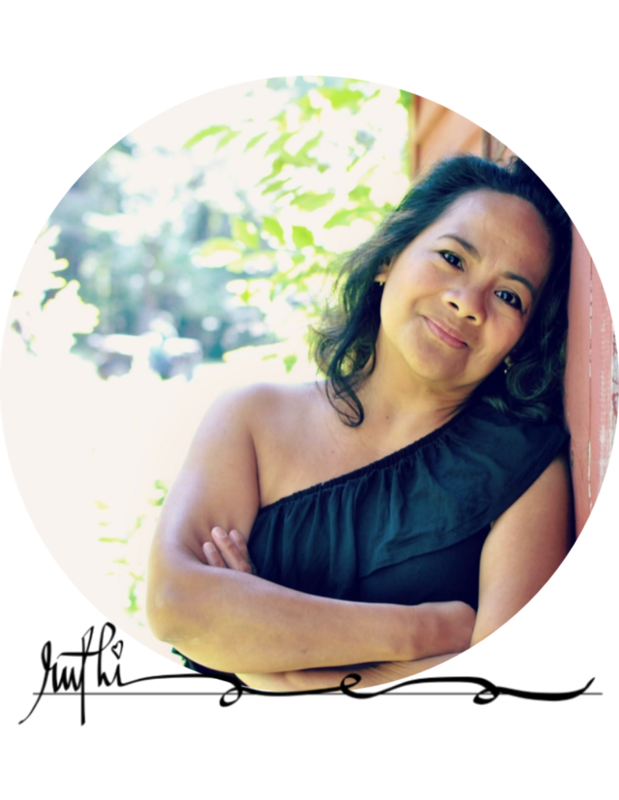 I am the Carpenter's WIFE and this is my online nook. 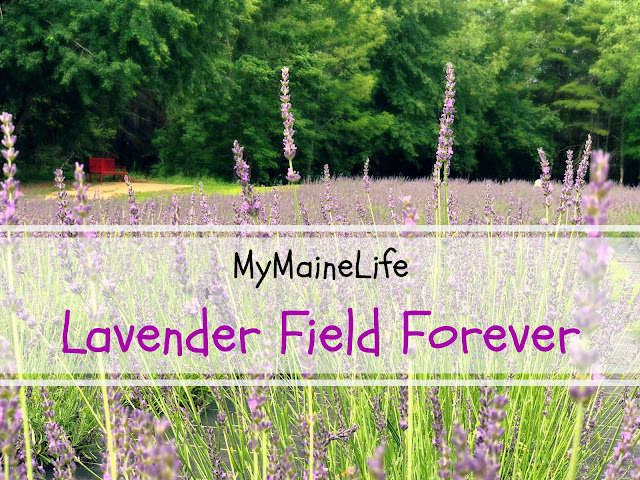 Feel free to explore my online abode where I freely share my nagging thoughts and incessant musings about my life as a wife and an immigrant in my adopted home - Maine. Hubby got me a new "baby"
my hubby's "baby"... broke down! It's indeed summer in Maine. The air is warm and comfy. The breeze is refreshing. And the sun is bright and lovely.